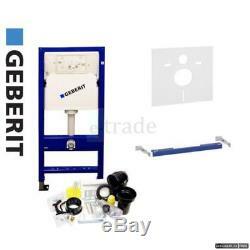 GEBERIT DUOFIX BASIC Wall Hung WC Toilet Frame UP100 DELTA Cistern +Brackets+Mat. GEBERIT Duofix UP100 Wall Hung WC Frame&##xA0. DELTA Concealed Cistern 112cm Height. HEIGHT: 112cm, WIDTH: 50cm, DEPTH: 12cm. 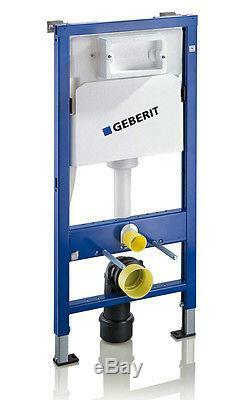 1 x GEBERIT UP100 TOILET CISTERN FRAME&##xA0. 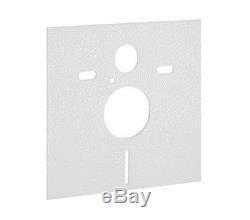 1 x FIXING WALL BRACKETS (set of 2). 1 x INSULATING MAT FOR NOISE PROTECTION FOR WC. Concealed&###xA0;Cistern&###xA0;DELTA&###xA0;(UP100)&###xA0;runs from&###xA0;the front&###xA0; &###xA0;&###xA0;&###xA0;&###xA0;&###xA0;Concealed&###xA0;Cistern&###xA0;with insulation&###xA0;anti-fog&###xA0; &###xA0;&###xA0;&###xA0;&###xA0;&###xA0;The ability to&###xA0;adjust the amount of&###xA0;flushing water&###xA0; &###xA0;&###xA0;&###xA0;&###xA0;&###xA0;Constants&###xA0;can be set at&###xA0;a smaller&###xA0;amount of water in&###xA0;the cistern&##xA0. &###xA0;With&###xA0;the factory settings, &###xA0;you&###xA0;can&###xA0;rinse&###xA0;immediately&###xA0; &###xA0;&###xA0;&###xA0;&###xA0;&###xA0;Water connection&###xA0;in the middle of&###xA0;the back&###xA0;/&###xA0;top&###xA0; &###xA0;&###xA0;&###xA0;&###xA0;&###xA0;Manually&###xA0;screw&###xA0;the hose&###xA0;connecting&###xA0;the valve&###xA0;angle&###xA0; &###xA0;&###xA0;&###xA0;&###xA0;&###xA0;The "stop"&###xA0;button&###xA0;actuator&###xA0;with&###xA0;Delta15, &###xA0;Delta11, Delta40&###xA0; &###xA0;&###xA0;&###xA0;&###xA0;&###xA0;Flush&###xA0;with&###xA0;Delta20&###xA0;bipartite&###xA0;trigger control, &###xA0;Delta21&###xA0;andDelta51 &###xA0; &###xA0;&###xA0;Frame&###xA0;powder coated, &###xA0;Ultramarine Blue&##xA0. Self-supporting frame&###xA0;with holes of&###xA0;9 mm&###xA0;to be mounted in&###xA0;a wooden wall&###xA0;frame&##xA0. &###xA0;&###xA0;&###xA0;&###xA0;&###xA0;Legs&###xA0;galvanised, &###xA0;continuously adjustable&###xA0;in the range&###xA0;of 0&###xA0;- 20&###xA0;cm&###xA0; &###xA0;&###xA0;&###xA0;&###xA0;&###xA0;Plate&###xA0;Floor-wide&###xA0;fitting&###xA0;for installation in&###xA0;UW50&###xA0;profile&###xA0; &###xA0;&###xA0;&###xA0;&###xA0;&###xA0;Depth&###xA0;of 12 cm The factory setting&###xA0;the amount of water&###xA0;to flush&###xA0;6&###xA0;and 3.5l&###xA0; The setting range&###xA0;for the&###xA0;flushing&###xA0;water&###xA0;with lots of&###xA0;4.5&###xA0;/&###xA0;6/&###xA0;7.5. &###xA0; &###xA0; &###xA0; &###xA0; &###xA0; &###xA0; &###xA0; &###xA0; &###xA0; &###xA0; &###xA0; &###xA0; &###xA0; &###xA0; &###xA0; &###xA0; &###xA0;&##xA0. &###xA0; &###xA0; &###xA0; &###xA0; &###xA0; &###xA0; &###xA0; &###xA0; &###xA0; &###xA0; &###xA0; &###xA0; &###xA0; &###xA0; &###xA0; THE ITEM IS BRAND NEW AND IS PACKED COMPLETE WITH ALL THE APPROPRIATE FITTINGS. PLEASE CHECK ALL GOODS UPON ARRIVAL. GET IN TOUCH &###xA0;if you need to have your order send via other than&##xA0. The courier services are being outsourced from a courier company, therefore we can't guarantee that the order&##xA0. Will be delivered in the specified time; nevertheless, we work with a very&##xA0. We issue VAT invoices with VAT stated separately. With E-Trade you have 30 days to change your&###xA0;mind and return the item. Just write to us to inform us about it, &##xA0. So we confirm the address. Feedback after receipt of your order would be very&###xA0;much appreciated-THANK YOU. E-Trade&###xA0; &###xA0;Klaudia Doe, &###xA0;106 Rowan Avenue, &###xA0;BN3 7JH Hove &###xA0;&###xA0; VAT No GB 238 4327 02. &###x200B;&###x200B;&###x200B;&###x200B;&###x200B;&###x200B;&##x200B. WATCH A VIDEO SHOWING HOW TO INSTALL A DUOFIX FRAME. Should you need an invoice with VAT stated separately, please get in touch or add a note to your order at the check-out. For standard post of 1st Class you should allow between 1-3 days despite the estimated date. Every listing has various postal options from Signed for, Tracked 24H courier or Next Day by 10:30 (at additional cost if needed) for your convenience. You will have to cover the cost of posting the product back to us. Any product you return must be in the same condition you received it and in the original packaging with all labels that it came with. Any claims for short deliveries, damaged goods or incorrect items must be advised within 3 days of the receipt of goods. Under no circumstances we will be liable for any loss, damages or remedial expenses whether or consequently arising from the goods supplied for any&###xA0;purpose. Please be aware it is your responsibility to check the product detail and item specifics where the information is provided. If in doubt please get in touch befroe placing the order. While we endavour to ensure that the product info&###xA0;and specs are correct, we do not warrant the accuracy of the material on the listings. Producer specs can alter at any time and we endavour to note these changes but cannot be held responsible for alterations beyond our control. &###x200B;&###x200B;&###x200B;&###x200B;&###x200B;&###x200B;&###x200B;&###x200B;&###x200B;&###x200B;&###x200B;&###x200B;&###x200B;&##x200B. Just write to us to inform us about it, so we confirm the address. Com or call: 7494 226600 Feedback after receipt of your order would be very much appreciated-THANK YOU : E-Trade Klaudia Doe, 106 Rowan Avenue, BN3 7JH Hove VAT No GB 238 4327 02. 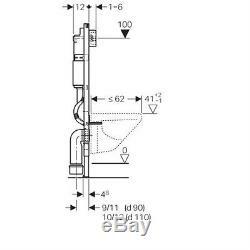 The item "GEBERIT DUOFIX BASIC Wall Hung WC Toilet Frame UP100 DELTA Cistern +Brackets+Mat" is in sale since Thursday, October 20, 2016. This item is in the category "Home, Furniture & DIY\Bath\Toilets & Bidets\Toilets". 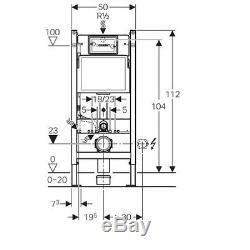 The seller is "e-tradebestsela" and is located in Partridge Green.